Queimada is actually made with the Galician liquor Orujo, but we have decided to give this drink its own page as it has its own tradition and it certainly merits talking about it. Queimada, which is also known as the Galician Fire Drink, is made from Licor de Orujo - a Spanish liquor made from fermenting and distilling the grape marc after grapes have been pressed- as well as bits of lemon peel, some sugar and coffee beans. 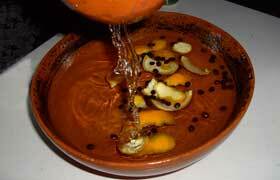 There are two parts that make up the tradition of the Queimada in Galicia: the drink and the spell. It is believed by many that the tradition of the queimada actually originated from the Celts who settled in the region we now know as Galicia many centuries ago which explains the pagan feel of the tradition. However, according to historians, there is no way that this drink could be connected with the Celts of Galicia, not least because the process of distillation did not arrive to the Spanish peninsular until the Moors occupied Spain - many centuries after the Celts lived there. Instead, if you take in the technology and the ingredients used in the recipe, it has been estimated that the queimada tradition actually originated in medieval times. The drink is made using the traditional liquor from Galicia called Orujo which is made from grape marc - or 'orujos' in Spanish. This is the main ingredient of the drink. Some of this liquor is put into a clay pot, along with some pieces of lemon peel, sugar and some coffee beans. The alcoholic mixture is then set on fire. After a while, once the flames from the pot turn blue, the flame is extinguished and the drink is then served in small ceramic mugs. The drink is then served warm once the flames have been completely put out, including with the pieces of lemon and coffee beans. However, if you try this drink, make sure you give your cup a good blow just to make sure that the flames have been put out completely - you don't want to burn yourself! In some places in Galicia, the traditional way of preparing the queimada drink is inside a pumpkin which has been cut open at the top and emptied of seeds and flesh - a bit like you do when you make a jack-o-lantern at Halloween. By doing this, they make sure that the drink also acquires some of the flavours of the pumpkin - meaning that the pumpkin is both a utensil and an ingredient. This spectacle is extremely exciting and it is often best seen at night, when the blue flames look their most impressive. Naturally, as the tradition is believed by many to be related to Celtic times, many people like to take it a step further and make it into a grander ritual. If you head to some of the more ragged beaches of the Galician coastline when you visit Spain, you may seem people dressed in Celtic clothing, often an animal hide, setting fire to pots of queimada on the rocks. It is also not uncommon to see people playing Galician bagpipes at these kinds of ceremonies. However, this is often done just for fun or for show. 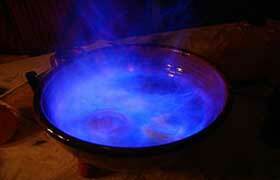 It has now become a tradition to recite a spell in Gallego, the language of Galicia, as the drink is burning. This is said to be a call to the different elements of nature to purify the drink and also to share it with the souls of friends and family members who cannot be there to enjoy the drink. While it is thought that the version of the drink invented back in medieval times may have been believed to have been useful for keeping away evil spirits, the current spell was actually only invented in 1967 in the town of Vigo by Mariano Marcos Abalo. Since that time, the queimada spell has been printed and sold and has grown in popularity - so much so that people have started to believe that the spell comes from ancient times as well. Despite not being as historical as many people believe, this drink is still part of the Galician culture and is a great example of the uses of some of the traditional spirits from Spain. If you ever get a chance to go to Galicia, make sure you try some of this mysterious drink!